Here is another batch of releases from Trapdoor Tapes which function to collectively illustrate the diversity of ‘industrial’ material being issued by the label. For the Cold Life tape this would appear to be their debut tape, which is focused on analogue, synth driven, minimal industrial to post-punk music (which I must admit seems to be relatively in vogue in recent years). 5 short-ish tracks feature here (being repeating both sides of the tape), where the material is structured around simplistic programed mid-paced to up-tempo beats, over which the straight-forward synth melodies generally follow. Vocals are then overlaid in a partly spoken/ sung style, which are also partially treated with a flange or vocoder effect depending on the track. There is also a rough ‘under-produced’ and noise infused feel to the production which gives it a degree of sonic grit and texture, which obviously works well with the analogue tape format. The mid tape track ‘Safe’ slightly deviates from the general approach described above, by featuring a darker edge to its soundscape, built around a minor keys synth line and more subdued programming. As demonstrated on this tape Cold Life nails its chosen analog electronic post-punk style with flair and a certain ‘no-frills’ directness. Although not necessarily bringing anything new to the table this will obviously be of clear interest for those into this style. Military Position on the other hand is the solo project of Harriet Kate Morgan which focuses on crude analogue industrial expression mixed with elements of a muted power electronics tone. This 22 minute tape features 4 tracks (2 each side) with the visual presentation opting to skew the typically expected colours and visual themes. 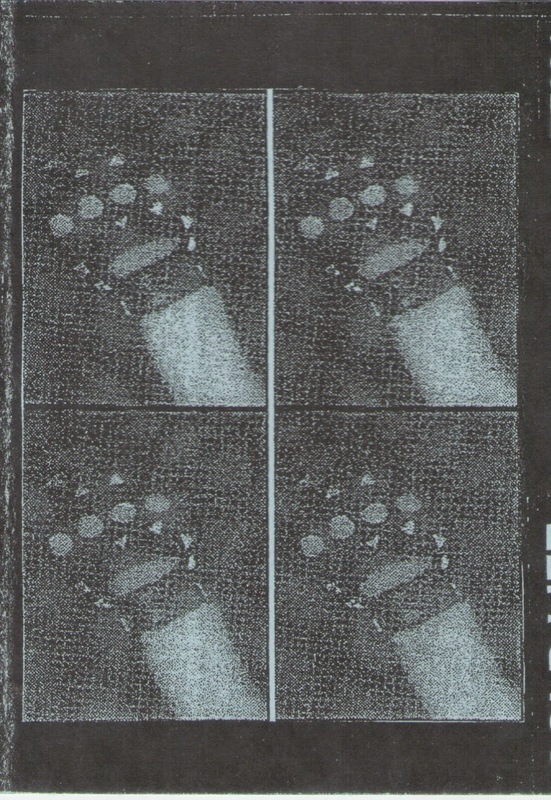 ‘We Rot’ commences the tape with a relatively simplistic heavy and ominous toned analogue industrial loop (being gradually morphed over its length), and slightly flanged spoken vocals brings to mind the delivery of vocals of Puce Mary – which no doubt is based on the fact that both projects being female fronted and inhabiting a similar sonic style. ‘Destruction and Abuse’ follows, being constructed with ‘idling machine’ sounding loops, where the spoken vocals are mostly buried under the sonic mass (a section consisting of a ‘whipping’ loop is tacked onto the end before it cuts out as the side finishes). 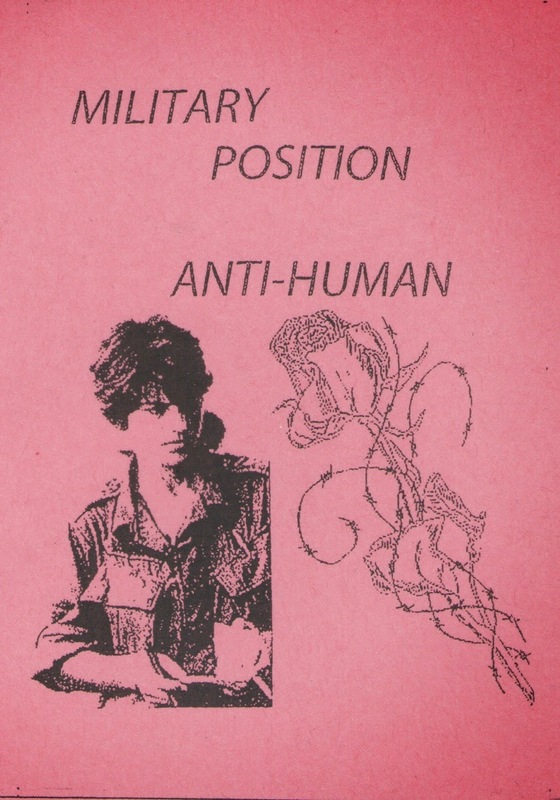 ‘The Personal is the Political’ opens the second side of the tape, although is listed on the cover as the final of the 4 tracks. With its apathy inflected and mild echo and distortion addled spoken vocals, it again bringing to mind the vocals of Puce Mary, which here are combined with rumbling bass tone and minimalist death industrial pulse. This is the standout of track of the tape by nailing a convincing analogue death industrial sound. The final track ‘Privileged and Weak’ contains a couple of segments, including a short interlude of heavy mid-paced pounding industrial beat and flanged vocals (great!) which cuts out somewhat abruptly before the main section arrives with slow and queasy oscillations (proceeding through a few sectional rotations before cutting out due to tape length). Overall ‘Anti-Human’ is a solid offering insofar as it demonstrates some strong ideas from a project finding its feet. This is not faultless tape, noting that added volume for sonic punch and more layering of elements for extra complexity and diversity would steps things up a notch. But such quibbles aside, more importantly it displays all the hallmarks of having the right sound, direction and ideas: where the approach of Military Position will no doubt be further refined with future releases. This entry was posted in 2014, 2015, death industrial, industrial, post punk, power electronics, Trapdoor Tapes by noisereceptor. Bookmark the permalink.